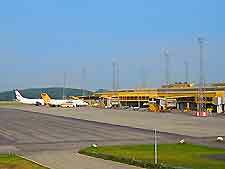 While Malmo Sturup International Airport doesn't necessarily offer the widest selection of ground transfer options, this is more than made up for by the regularity and efficiency of the airport coaches that serve Malmo, Lund and Copenhagen. Alternative transport options include taxis, free hotel shuttles and limousines. Airport coaches operate services between the airport and Malmo and Lund. Up to 30 vehicles a day run these routes and journey times are around 40 and 45 minutes respectively. Coaches also run to the central station in Copenhagen. Should you book a room at one of Malmo's popular or reputable hotels, then the chances are that the establishment of your choice will provide a vehicle to bring you from the airport to your lodgings. Check the availability of such services ahead of your arrival at the airport. Taxis are available from outside of the Arrivals area. Journeys to Malmo and Lund are generally set prices however passengers are advised to agree the price with their driver before getting into the taxi. There are no limousine companies operating at the airport. However, the Malmo Hyrverk limousine company can provide limousine pick ups by prior arrangement. Call: +46 40 136300 for more details.